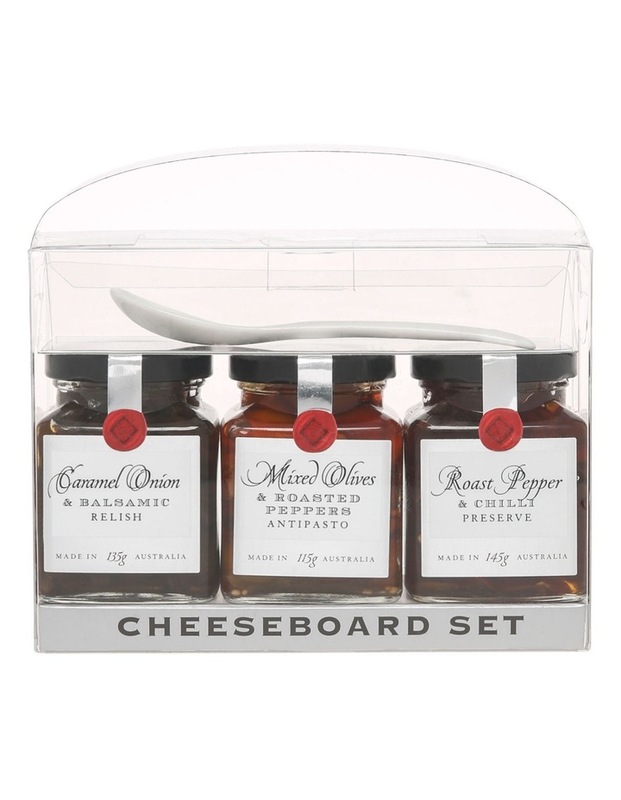 The Cheeseboard Set Trio Pack from Ogilvie & Co is a carry home gift pack featuring a savoury preserve and relish with an olive & peppers antipasto. Pack contains: Roast Pepper & Chilli Preserve 145g, Caramel Onion & Balsamic Relish 135g and Mixed Olives & Roasted Peppers Antipasto 115g. This set also comes with a ceramic serving spoon. These condiments are gluten free and made a great accompaniment to cheese. Ogilvie & Co is an Australian family-owned manufacturer and wholesaler of quality gourmet food products. Founded in 1987 in Perth, Western Australia, the key features of their range are the use of traditional preserving methods and quality raw materials, which are sourced locally wherever possible. ALLERGY ADVICE: Manufactured on premises that handles PEANUTS, TREE NUTS and SESAME SEEDS.